Desktop database or web app? 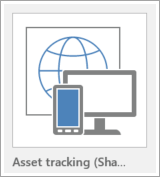 View and sort data online, using any device, in an Access web app—even if you don’t have Access. The fastest way to get started is to use a template. When you select a template, Access assembles an app that contains the tables you probably would have added yourself if you had started from scratch. 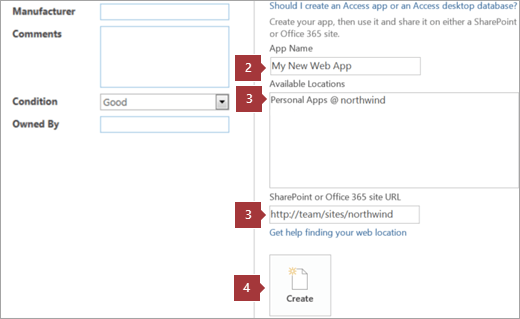 Note: To create an Access web app, you need Office 365 with SharePoint Online, on-premises SharePoint Server 2013, or SharePoint Server 2016 with Access Services and SQL Server 2012 (or higher). Tip: If you need to close a database, select File > Close. Tip: If you don’t see the template you want, under the Search for online templates box, select Databases. 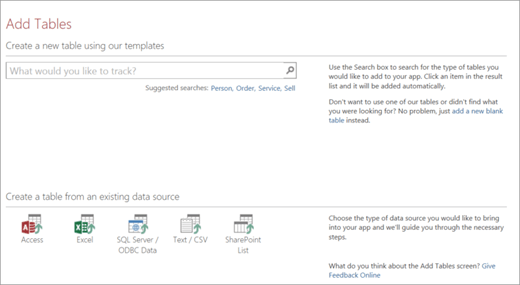 Then, to find database templates on Office.com, enter one or more keywords in the search box. Enter a name for your new app. 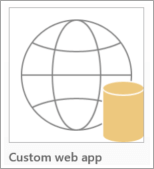 Creating an Access web app from scratch is very similar to creating one from templates. The biggest difference is that you create the tables in your web app. Open Access, and select Custom web app. Enter a name for your new web app, and select its location. Then, select Create. Add structured or blank tables to the web app, or create tables from existing data sources. Search for a table template based on the type of information you want to track, create a table from the existing source data, or add a blank table to customize yourself. When several people need to use a database at the same time, build an Access web app, which is a web database that runs on most browsers. To create an Access web app, you need a SharePoint 2016 or SharePoint 2013 server, or you need Office 365. To USE an Access web app, you just need to be connected to the Internet or your corporate network. The easiest way to build an Access web app is to use a template. You can select one when you first start Access or when you select File > New. The set of Access templates include DESKTOP DATABASE templates and WEB APP templates. You can tell the difference because a web app template is marked with the globe icon. Select the template you want, … enter a name, … and then select a server from the list HERE, or enter a server name HERE. Access downloads and opens the template. To start working, select Launch App. This starts the database in your browser, and now you can start entering your data. But remember, unlike in an Access desktop database, in an Access web app you must remember to select Save to save your data. The other thing to remember about Access web apps is you use them in your browser, but you create and change them in Access. To do this, select Customize in Access, … select Open, … and the file opens in Access. Notice that the ribbon is smaller than what you see in an Access desktop database. These are the tools you need to work on web apps. Let’s open this view for editing—this is called Design View—and make a quick change. Press the Control key, … select the labels, … change their color, … and align them to the right. Select Save to publish your changes to your server. Now select Home, and then select Launch App. There you go. We’ve created a database in just minutes and we don’t need to change anything unless we want to. And because it’s an Access web app, your team members can now open and use this database in their web browsers.